Around this time last year, we made a video of our lab and office. Since then, quite a few things have changed. As you can see, we’ve made a few additions to the lab in addition to stainless steel benches (which are now fairly scratched up but not dented!). OGI Megascope with Firetrace and AGS Performance Grading Software (under the monitor). We also recently updated the software which seems to have produced better Firetrace results and more accurate measurements. 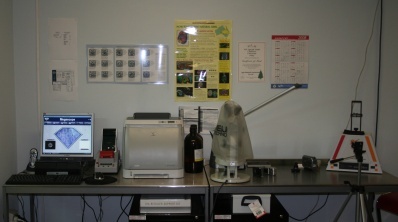 Sarin DC-3000 Colorimeter (the white thing with the red top). This allows us to verify colour in a matter of seconds. We only received this last week, so it’s too early to tell how accurate it really is, but watch this space for details. An HP colour laser printer for printing out certificates. Bottles of methanol, for cleaning diamonds. Trinocular microscope for looking at inclusions and taking microscopic photos. Various cameras and a tripod. A light jewellery light box from MK Digital for taking pictures of our engagement rings. So What Is The Purpose Of This Lab? The purpose of the lab and all the equipment in it is not to replace a GIA certificate, but rather to add value and instill confidence in our diamonds. For example, most people who know the GIA cut parameters agree that their grading just plain stinks. However, most consumers trust GIA grading with respect to colour and clarity. Furthermore, the majority of Australian consumers have no idea who the AGS is, who grade to GIA standards in terms of colour and clarity and have the best cut grading system. Therefore, to sell “Ideal cut GIA certified” diamonds, equipment such as the Ideal-Scope, AGS ASET and Megascope with AGS Performance Grading Software is essential, and is the main purpose of the lab. Our lab also allows us to get that little bit closer to consumers buy show them microscopic photos and videos of our diamonds. Do We Grade Other People’s Stones? Since we have a colorimeter and Megascope, we are able to grade the colour and cut of a diamond. However, we do not grade, nor comment on diamonds sold by others – only ours. Whilst it may seem like a good and perhaps profitable idea to do so, it is not something we’d like to get involved in. Actually, our lab is great for diamonds around the 15 point mark. Since these can not be certified, getting the entire 4Cs from an in-house lab is tremendously beneficial. In fact in a month or two, we plan to extend our Crossfire earrings to 15 points and below. These stones will have in house grading certificates. Each stone takes on average 30 minutes to analyse and process the photos and videos. Therefore, at times there may be a 1-2 day wait (sometimes more!) between the diamond arriving and the analysis being posted on our website or sent to the client. This is why some of our Crossfire diamonds only have GIA certs posted on our site. This entry was written by Nikhil Jogia and was posted on on Monday, February 18th, 2008 at 9:42 pm	and is filed under Taking Care of Business. You can follow any responses to this entry through the RSS 2.0 feed. You can leave a response, or trackback from your own site. Great information. I’m researching laser printers for my small office.